Patchwork cot quilt, machine pieced, rectangular, 5 x 4 squares. Assorted fabrics including seersucker, corduroy, printed and plain cottons. White ric-rac braid and zigzag machine stitching accentuate rows. Edge of white cotton tape. Backing is single flour bag, calico, with maker's printing visible through patchwork: 'Tiger. Best Australian Roller Flour. Mala Foot. Sole Supply. Part of Kuala Lumper' and Chinese characters. 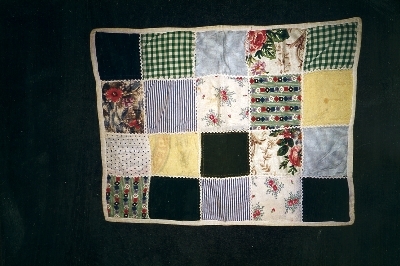 The quilt is thought to have been made in the 1950s. It is not known who the maker was. It was donated to the Albury Regional Museum [NSW] in 1969.